The field of Personnel Psychology is broadly concerned with the study of individual differences and their consequences for the organization. As human resource costs continue, for most organizations, to be the single largest operating cost (50-80% of annual expenditure), achieving optimal performance from individual employees is of paramount importance to the sustained development and financial performance of any organization. 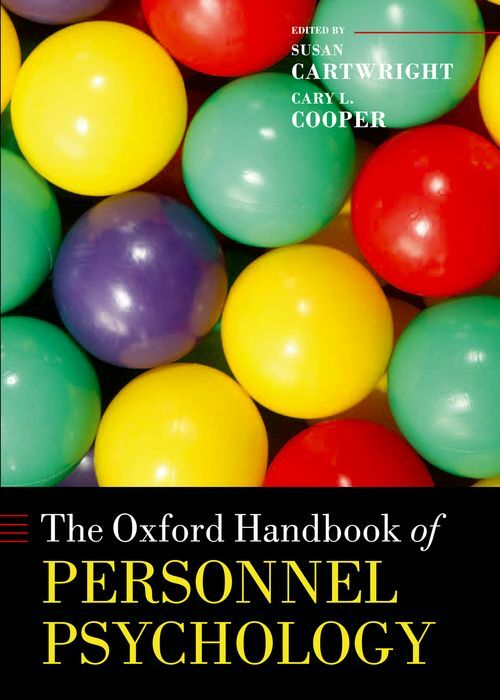 The Oxford Handbook of Personnel Psychology brings together contributions from leading international scholars within the field to present state-of-the-art reviews on topical and emergent issues, constructs, and research in personnel psychology. The book is divided into six sections: * Individual Difference and Work Performance, * Personnel Selection, * Methodological Issues, * Training and Development, * Policies and Practices, * Future Challenges. While the Handbook is primarily a review of current academic thinking and research in the area, the contributors keep a strong focus on the lessons for HR practitioners, and what lessons they can take from the cutting-edge work presented. 2. Emotional Intelligence: Rhetoric or Reality? Susan Cartwright is a Chartered Psychologist and Fellow of the British Psychological Society. She is Professor of Organizational Psychology in the Manchester Business School at The University of Manchester, UK. Susan is currently the President of the British Academy of Management and a Fellow of the British Academy of Management. She is a past Editor of the Leadership and Organization Development Journal and a current Associate Editor of the British Journal of Management. Susan has authored 13 books, over 40 scholarly articles, and 30 book chapters. Her main research interests lie in the area of occupational stress and well being, human aspects of mergers and acquisitions and emotional intelligence. She was Editor of the Volume V of the Blackwell Encyclopedia of Management on Human Resource Management (Blackwell, 2005) and Co-Editor, with Cary L. Cooper and Christopher Early, of The International Handbook of Organizational Culture and Climate (Wiley, 2001). ; Cary L. Cooper is Professor of Organizational Psychology and Health in Lancaster University Management School and Pro Vice Chancellor (External Relations) at Lancaster University. He is a Fellow of the British Psychological Society, the Royal Society of Medicine, and the Royal Society of Health. Cary was the founding Editor of the Journal of Organizational Behaviour and is Co-Editor of Stress and Health. In 1998, he was the recipient of the Distinguished Service Award for his contribution to management science from the US Academy of Management. Cary is the author of over 100 books on occupational stress, women at work, and industrial and organizational psychology and has written over 400 scholarly articles.